Many of us have accepted Yeshua as our Lord and Redeemer, yet we are unable to trust what He has accomplished for us. Yeshua bore our punishment for all time so that we could maintain a relationship with YHVH and be a part of His family and His kingdom. We have all heard this message preached, taught, argued and dissected until the words have perhaps become meaningless to us. Words are not enough; each of us must experience the love of YHVH. Too often Yeshua’s sheep silently struggle with guilt, regret, and shame that bog us down and block us from enjoying our Father’s overwhelming love. Instead, we are inundated with misery that YHVH never intended for us to experience. Do we believe that if we suffer enough, we can somehow make up for our sins? Truly, there is no way that we can pay for even one sin. It doesn’t seem right to us that we can repent and walk away free. Perhaps that is why we find it so difficult to forgive those who have wronged us. If others have made us suffer, then we feel justified in wanting them to suffer also. We do not see things from YHVH’s perspective. We forget how He rejoices over recovering the lost sheep (Luke 15:1-7) or re-uniting with the prodigal son (Luke 15:11-32). When things go wrong, we think that YHVH is punishing us, even when we have repented and turned away from sin. It is right to loathe the sin, but we must not loathe ourselves. Our experiences in this world color our perception. We assume that YHVH loves the way people love: half-heartedly, sporadically, conditionally, and so on. Over the last several months, I have encountered numerous others who are struggling to see themselves as YHVH sees them. I, too, tend to see myself from a worldly perspective rather than as YHVH sees me. YHVH loves us extravagantly not because of us, but because of who He is. 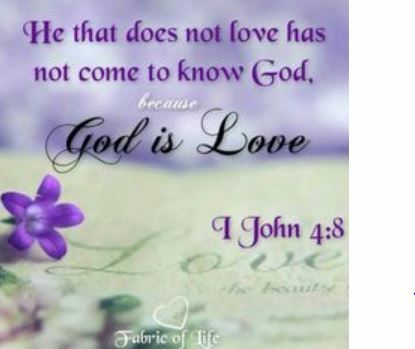 What does it mean to us that God is love? 1 Cor 13:4-7 provides some helpful insights. YHVH does not keep a record of our wrongs and is not easily angered. He is focused on us, not on Himself. He believes in us, trusts us and hopes in us. He is willing to endure all things so that we might be loved into reaching our full potential. Derek Prince in a work entitled “The Divine Exchange” has provided a beautiful illustration of YHVH’s love through Yeshua’s sacrifice. Below is a summary of “The Divine Exchange”. Sin causes damage and loss. In John 10:10, Yeshua tells us that the thief comes to steal, kill and destroy. Yeshua came so that we might have abundant life. Yeshua came to recover, restore, replace, re-unite and revive. Let us throw off the temptation to dwell on the past, on what has been lost or destroyed, and focus instead on what Yeshua has done, is doing, and will do. YHVH’s love releases us from every burden and barrier, so that we are free to release His divine love to others, including ourselves. When we are truly set free by His love, we will be able to love as YHVH loves. Previous PostDoes God care about Genes or Jeans (Part 2)?Next PostOh the Depth of God !